1. Preheat your oven to 450. Peel your potatoes if desired. Cut the potatoes into sticks, about 1/4 inch thick, no thicker!! Try to make them uniform so they all cook well at the same time. 2. The most important part!! Soak the fries in cold water for 20 minutes. If you don't they will be all mushy and won't cook very well! 3. 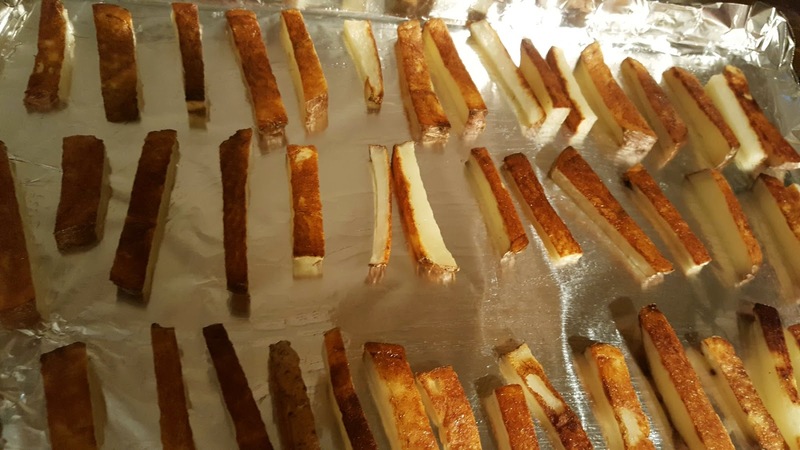 Drain the fries, blot them and try to dry them as much as possible. 4. Toss in some olive oil. 5. Place them on a greased pan, without them touching. Salt the fries. Bake 15 minutes, flip then bake another 15 minutes.